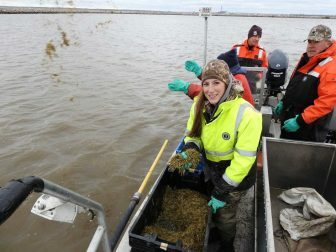 Wisconsin volunteers once again planted wild rice in Green Bay-area wetlands to protect the native plant from invasive species. 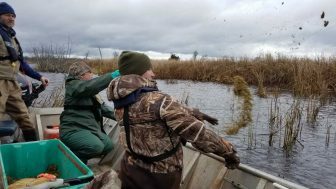 The group spread 2,000 pounds of wild rice recently over 40 acres of water along the east shore, the lower bay and the west shore. This is the second year organizations across Wisconsin have planted wild rice to restore these ecosystems. Volunteers go onto the lakes in boats in late fall and throw seed into the water. The seed settles in the lake bed and germinates in the spring. Wild rice is an important food resource for fish and other wildlife, she said. Invasive species, such as cattails, have been taking the place of wild rice in wetlands. That causes problems for native plants and animals. Ducks Unlimited has taken the lead on this project, but the organization has partners across the state including University of Wisconsin-Green Bay, the Wisconsin Department of Natural Resources, U.S. Fisheries and Wildlife and University of Wisconsin Extension. “We hope to permanently re-establish native vegetation in the bay that was once lost,” Glenzinski said.